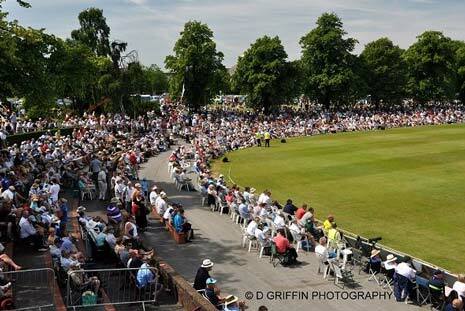 Yorkshire totally dominated the opening day of this County Championship match at Queen's Park, Chesterfield. Having lost the toss, Derbyshire were made to wilt in the sun on a pitch which offered hardly any assistance to the bowlers - and no gremlins for the batsman. Alex Lees and Phil Jaques' record breaking unbroken partnership of 307, has set the Tykes a difficult target to match. The two batsmen made no mistake with any loose deliveries from the Derbyshire quick bowlers Mark Footitt and Mark Turner. The home side were forced to rely on slow bowlers Peter Burgoyne (left) - who was on his Championship debut - and Wes Durston, to stem the flow of runs. 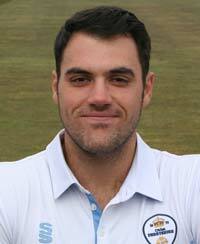 Derbyshire brought Turner back into the side to replace Jon Clare. Burgoyne and Ben Slater, who both made 150's for the second XI last week, came into the side to replace David Wainwright and the injured Shivnarine Chanderpaul. Derbyshire made an early breakthrough when Adam Lyth was caught behind off Footitt when the score was on 22, little did Derbyshire know that this was going to be the only wicket for 74 overs! Yorkshire batted at a rocket pace in the morning session scoring 151 at 5.25 an over and whilst they were, to a certain extent, kept in check in the afternoon session by the Derbyshire spinners, the runs still came at rate which Yorkshire will be pleased about. The threat of any wickets for Derbyshire had just about ceased with the Yorkshire batsman offering absolutely nothing. Turner, Footitt and Groenewald were rotated at one end with Peter Burgoyne who bowled an unbroken spell of 23 overs for just 42 runs at the other, the 19 year old bowling well for no reward. Post Tea and the partnership became a record breaking one, Lees brought up his 150 which also broke the highest 2nd wicket partnership versus Derbyshire of 305, a record which had stood since 1910. Phil Jaques was eventually out caught at first slip by Wes Durston from the bowling of Tim Groenewald for 139 The Australian's innings lasted 253 balls, he had hit sixteen fours and two sixes. Derbyshire then chose to take the new ball, but couldn't find the third wicket before close of play and the day belonged to Yorkshire's Alex Lees, who finished 171 not out from 286 balls. Burgoyne who finished the day wicket-less after bowling 33 overs said that today was very hard work, "It was a good experience for me, but the team are not in the best position. We tried hard in the middle overs, we tried to put pressure on them and we felt we did, to try and force them into a mistake." Burgoyne was full of praise for the crowd at Queen's Park, a ground where he made his debut as a 17 year old in 2011, "It's a place where I made my debut and it was nice of them to keep me going with encouragement." Not wanting another day like that, Burgoyne stated that, "hopefully, we can knock them over in the morning and then it's our turn to have a bat and see what happens."